Put a pot of water on the stove. Push the heat to 200 degrees. Up goes the water temperature in the pot. Jack the temp to 211 degrees. Nothing much changes, does it? Then add one tiny little degree. Bam! 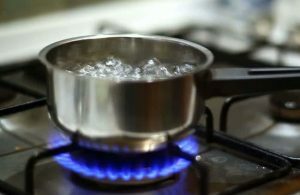 The water in your pot roils to a boil! Is your “pot” (business) boiling or simmering? Or barely changing temperatures? The catalyst to go from tepid water to a crazy boil requires you to gather and use insights into the mind of your Ideal Customer. Your customers are human. They use human conversation. Human conversations drive the language of successful businesses. Your finest business occurs when you speak to your human customer in the language they hear, see and understand. That language revolves around the thing of most interest to them. Specifically, solving the problem they actively want to rid of. What’s your Ideal Customer’s problem? What are they tired of living with, and you can cast it out? What language do they use to express their problem? Answer those questions. Use the answers in your business –your marketing and sales, to be specific – and watch what happens. People who paid no attention will look your way. Prospects who heard “blah, blah, blah” instead of your conversation will take note. Website visitors who moved on without a call or an opt-in will connect. Your business will change. This year. You know how to be human. Yet, perhaps you’ve forgotten in this age of amped up Facebook nonsense and monotone mission statements (save that for your employees). Humans still relate to humans. Humans understand conversations. What should you change…right now…to alter your marketing and sales blandness in favor of a true, authentic, customer-centered conversation focused on eliminating the problem your Ideal Customer wants to eradicate? Focus the conversation on their problem as they see it. Not your solution. Problem recognition comes first. Until your prospect understands you understand their problem, you have little opportunity to make any kind of connection to the solution. Focus on your human, their problem and how they express it. Then realize they’ve just handed you everything you require to create a great conversation, relationship and sale.